Amazon earnings tonight after the bell represents another tech titan reporting in light of Apple, Facebook, and quite a few others this week. On the AMZN monthly chart, below, the long-term bull case would be that the stock has simply pulled back to its rising 20-period monthly moving average (orange line), a reference point the stock had actually not tested during its ascent since 2015. The bear case would be that the stock had simply become priced for perfection and that it is no long the ultra-premier growth name in tech with a focus instead by growth manager on up-and-comers like NOW TEAM TTD, etc.. 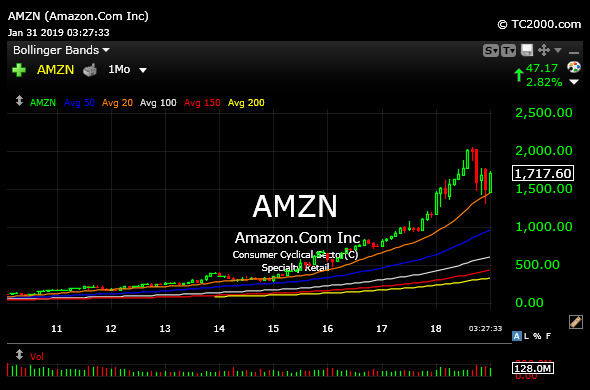 Either way, I suspect the market will still be sensitive to how AMZN reacts tonight.